1) Enter Bible College. Nothing will put you to sleep faster than a mandatory chapel service or a Church History lecture given by a man who actually met Moses. Trust me, I know. 2) Invest in a large rubber mallet. When you can't sleep hit yourself in the head. There's nothing like a good concussion to send you off to dream land. Ever notice how new moms are always begging for more sleep? They don't struggle with insomnia at all. Just think - from conception to giving birth (which is the equivalent of squeezing a watermelon through a paper towel tube) is enough to make anyone sleepy. Then the real fun begins. Changing diapers, teething, scrubbing spit up out of your clothes, being up all hours of the night. Trust me, you will no longer have any insomnia. HOWEVER, if you are not married this is very bad advice. In fact, if you're not married and you're reading this - no matter who you are - cinch up your chastity belt and go pray. 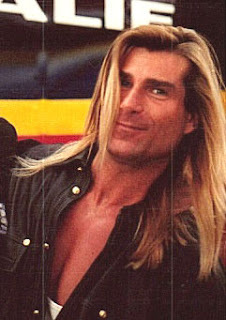 Before you know it slick chested visions of Fabio might cause you to stumble. And not only would that be sinful, it would also be just plain gross. 4) Think up 4 crazy reasons why you love Idaho. For example, my sister, who is 37% funnier than I am said, "I like Idaho because it's not pronounced 'Imaho'." She makes a good point. But why do YOU love Idaho? You could win some kleenex with nuns printed on them that say, "God Bless You". And who doesn't love a consecrated tissue during cold and flu season?? Kelli, I hope this helps! Any other advice for Kelli???? Giving birth is like sneezing a watermelon through a paper towel tube. That's classic humor, right there. Ranks up there with Cosby's wife telling him to pull his lip over his head. As for sleepy Kelli... just give in and use that time to tackle your to-do list. Then you'll be productive while you cuss. And, like a sugared-up toddler running around living room furniture, you'll eventually fall over from exhaustion. Or you could exercise. Great advice Stacy!! Also Kelli, try being too busy to sleep. Have you ever noticed that you want to sleep when you can't? I have a two year old and a one year old. Will I ever catch up on sleep? A Correction AND A CONTEST!!!!! Contest Winners!!! And another giveaway SOON!!!! Good Taste, Pigs Feet & 1-888-RU-MY-DAD? SFL's FIRST CONTEST! YOU COULD WIN BIG!!! !